In this unit you will learn more fretted notes on the first string, key signatures and cut time meter. 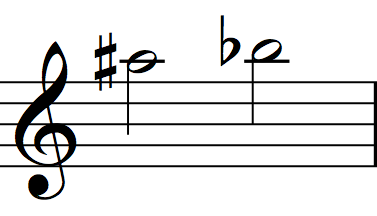 ‘A♯’ and ‘B♭’ are enharmonics. To play ‘A♯’ or ‘B♭’, fret the sixth fret on the first string. ‘B’ sits on top of the first leger line above the staff. To play ‘B’, fret the seventh fret on the first string. ‘C’ is in the second leger line above the staff. To play ‘C’, fret the eighth fret on the first string. Key signatures serve two important functions. First, they free the score of too much visual information, which in turn aids sight-reading. Second, they designate the key of the piece. A theoretical understanding of keys is useful, but not necessary for sight-reading. As long as you understand the rules outlined below you will be able to play music with key signatures. However, if you want to learn more about music theory, I advise you to enroll in a music theory course, or teach yourself via MusicTheory.net. Each accidental in a key signature alters notes at all pitch registers of corresponding staff positions throughout the piece (or section). If an altered note needs to be temporarily ‘undone,’ then a natural symbol will precede the note in the score to indicate the change. The change caused by the natural will last for the duration of the measure. 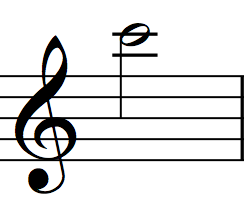 The key signature above contains two sharps. The center points of the sharps are positioned where ‘F’ and ‘C’ are placed on the staff. This means that all ‘F’s and ‘C’s, in all pitch registers, are to be played sharp, even though sharp signs will not precede the notes in the score. In the example above, the notes to be played are F♯, F♯, C♯ & C♯. The key signature above demands that all ‘F’s and ‘C’s are to be played sharp, unless ‘undone’ by a natural symbol. Notice the natural on beat two. The notes you must play in the example are: F♯, F-natural, C♯ & F♯. Take a moment to familiarize yourself with the key signatures below. Please note that key signatures usually contain either all sharps or all flats. Also, a key signature does not have to contain sharps or flats. Two of the most common key signatures are entirely free of accidentals. Cut time is a fairly common meter. It typically appears in the time signature as a ‘C’ pierced by a vertical line. Cut time can also be represented by a 2/2 time signature (or with the phrase alla breve ). The rhythmic notation in cut time can look like the rhythmic notation in common time (AKA simple quadruple meter). However, the main difference between them has to do with rhythmic emphasis. In the example above, notice how the beat accent falls on every half note in cut time and on every quarter note in common time. Think of cut time as having 50% fewer pulses than common time. Further, cut time often corresponds with a faster tempo. Finally, the difference in feel between cut time and common time is significant. Play the two following examples to get a sense of the difference in feel. Remember to look at the key signature and time signature before you start sight-reading. Beginning sight-readers may forget to alter notes displayed in the key signature. With practice, it will become easier to remember which pitches to alter. Start with key signatures that have between 1-3 sharps or flats and then work your way up to key signatures with 4-7 sharps or flats. Before starting a piece, I recommend improvising in its key. This habit will train your mind and fingers to execute the altered notes with intuitive ease. The following exercise is in a cut time meter. Since there are two half note pulses per measure, the count-in bell will be struck two times. Remember to check the key signature before you sight-read! The next exercise contains a B-flat in the key signature. The next exercise is in mixed meter. Take a moment to understand the logic of the changing meters before you sight-read. I’ve added suggestions for counting on the score. Notice the repeat signs as well. The next exercise contains an F-sharp in the key signature. The next exercise contains a B-flat in the key signature. The next exercise contains an F-sharp and a C-sharp in the key signature. The next exercise contains a B-flat and an E-flat in the key signature. The next exercise contains an F-sharp, a C-sharp and a G-sharp in the key signature. The next exercise contains an F-sharp, a C-sharp, a G-sharp and a D-sharp in the key signature. Notice the key signature of the next piece. From now on, it is up to you to notice the key signature at the beginning of each exercise and composition. The indication ‘l.v.’ in the upcoming Guitar 2 part is short for “let vibrate.” Pluck or strum the note in accordance with the notated rhythms. However it is okay to let the note(s) ring longer than notated. The asterisks (*) in the next piece take you to the composer’s prose directions at the bottom of the score. Make sure to read and understand these directions before sight-reading the piece.